What a vibrant London wedding! The wedding day of Charlotte and James epitomises all that is great about London, mixing old and new, water and land, the functional and the splendid! It can be quite a challenge to capture so many aspects of London and all the wedding details and then fit them all into the short films! London was the obvious choice for the Charlotte and James. Charlotte is from London and loves it, and they met in London and have lived together there for many years. James’ parents and his older sister both got married at the Church of St Bartholomew the Great and it’s the oldest church in London. The contrast of the very modern Trinity Buoy Wharf, where they had the reception (after drinks and canapés on the boat ride there!) along with the view towards Canary Wharf was the deciding factor for the couple when choosing the locations. There was just so much to film all day: the groomsmen’s pub breakfast, the bus ride to the boat and charlotte’s surprise for James - leaving by boat at midnight! You can really feel and see the joy throughout the day. A day filled with family, friends, laughter and love! What’s more to want?! 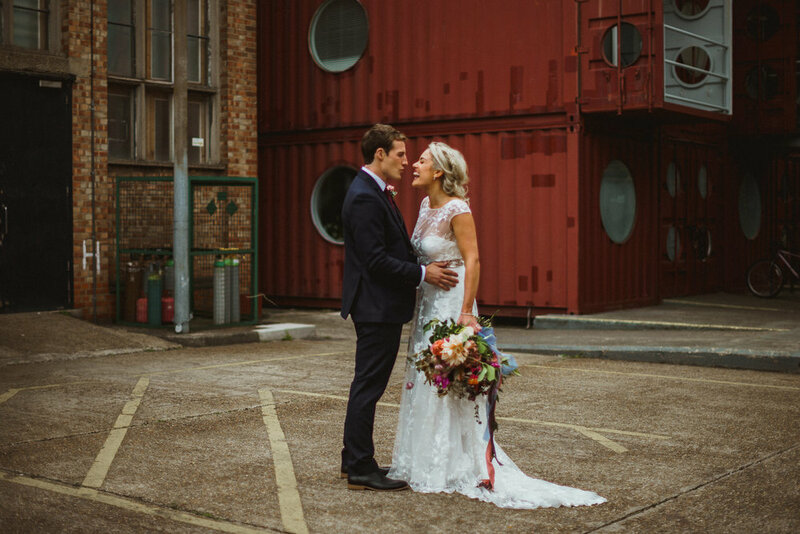 It was a pleasure to work with Gen from Miss Gen Photography and Charley Beard and Rebecca Kobus of London Bride who planned this wedding to perfection.